We’ve put together a 5-minute video highlighting Doctor Graham’s incredible ability to call the American people to Jesus Christ. It includes a part of his final public sermon in July of 2006 at Camden Yards in Baltimore, Maryland. 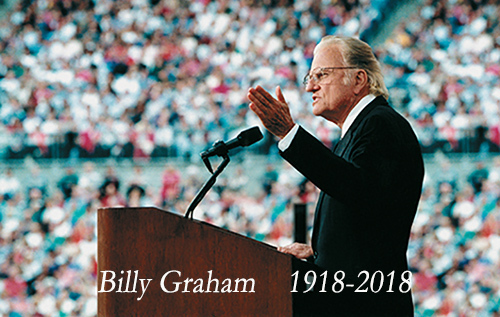 Millions of Americans and countless others around the world have been reporting on the legacy Billy Graham since the news of his death was announced. Popularly labeled as “America’s Pastor,” Reverend Graham passed away at age 99 at his home in North Carolina on February 21. Reverend Graham lain in honor at the Capitol Rotunda in Washington D.C. on Wednesday. He is the first spiritual leader ever to receive that distinction. His body will be returned to North Carolina for the private funeral on Friday. He will be buried beside his wife, Ruth, who passed in 2007. Both had caskets made by inmates of the Louisiana State Penitentiary at Angola, where they had funded two chapels. While the funeral service is private, the public will be able to watch a live stream beginning Friday, March 2 at 10AM EST. Billy Graham preached to over 215 million people at more than 400 crusades, simulcasts and evangelistic rallies since 1947. Doctor Graham, the Thomas More Law Center thanks you for your steadfast defense of the Christian faith and your incredible witness of the Gospel. God only knows how many millions of people came to know Jesus Christ through your dynamic and passionate evangelism. May you rest in eternal peace.